.Summertime in the Northern Hemisphere brings warmer temperatures and an array of natural beauty. It can also be a busy time for some with travel to see extended family members. However, it is important to nurture our marriages throughout the year. 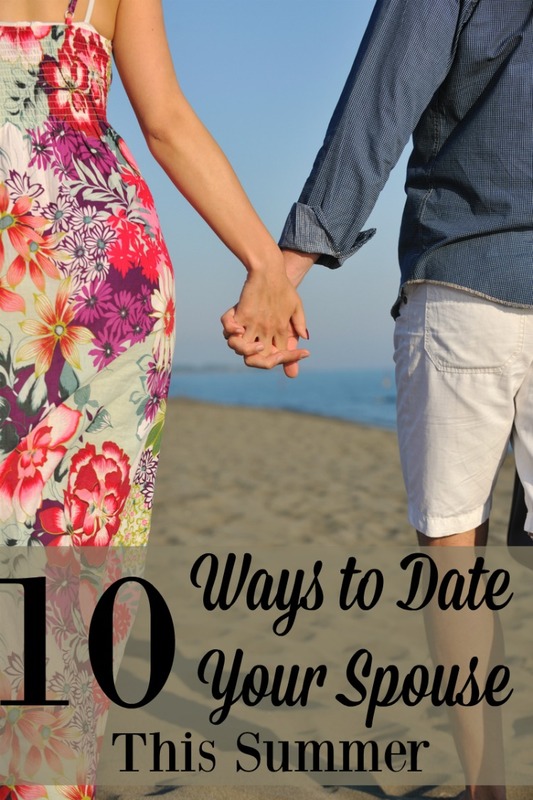 Here are 10 ways to date your spouse this summer that can help you build intimacy and memories to keep you warm through the cold days of winter. This can be done after dinner during the week or on a leisurely weekend day. Just getting outside to enjoy good weather and see what is happening around your home is a great way to spend time. Doing it while holding hands with your spouse makes it an awesome time to reconnect after a long day of work or other activities. This isn’t about getting some great exercise (e.g. running together or a vigorous hike), but rather about making those connections. Love notes do not have to be lengthy and filled with flowery language. However, a hand-written note tugs at your heart strings in its own special way. You can pop it into their briefcase or lunch box. Or even on their pillow if they wake up after you. Sending a text is a substitute, but just not the same. Whether it is their favorite entree or dessert, people like to know others are taking their preferences into account. So set aside some time to whip something up for the one you love and surprise them with it. Summertime evokes thoughts of America’s favorite pastime…baseball! While attending a major league game can be a lot of fun, not everyone has that kind of access. Look around and you may find a minor league team near you or even pick a little league event just to enjoy sitting in the bleachers while snacking on hot dogs or popcorn. Look in your local paper or on websites for the area to find a festival you would both enjoy. Walk around to see the sights, enjoy some food from the vendors, and maybe even find an open air concert to enjoy. While this isn’t easy to do in Alaska given that summer is the land of the Midnight Sun, for many you can grab a blanket and take a drive to a location for a little late night star gazing. Pack some wine if that’s what you enjoy and prepare to lay side by side while looking at the sky. If you are both readers, then this might be easy to do. Otherwise, find a title which appeals to both of you agree upon and establish a book club for two on a set date later in the summer. This is great for a particularly rainy summer, too, as you can read the book and have the discussions anywhere. Start it all off with a trip to the local bookstore to browse and find the title you’ll read. Our Barnes and Noble in Anchorage has a Starbucks inside for grabbing a coffee as well as plenty of comfy chairs to sit and mull over the options. It is easy to find yourself just talking about how your day at work went or what the kids are doing. But, have you set aside time with no distractions to just reconnect and listen to how they are feeling? It doesn’t have to be long, but rather a time where your listening ears are fully tuned and you give them time to just share. Turn off the radio or TV and find a comfortable, private spot for your chat time. When you are in the midst of raising kids, it can be easy to not think about the future. Many of us had ideas in our youth of things to do, yet those ‘bucket lists’ have fallen by the wayside. Take time for a conversation to discuss what you’d like to do together as a couple. It could be something as simple as taking a dance class together or more elaborate as planning a month long trip through Europe. This could be something elaborate where you have to travel a bit to get there, or just a night at a near by hotel or bed and breakfast. For the more adventurous, find a spot to go camping. There is nothing quite like snuggling together in the close quarters a tent provides. Personally, I’d meet my husband midway and suggest an overnight in our RV! What are some ways you like to date your spouse during the summer? Note ~ This post was originally published on Apr 25, 2016. Hi Laura, I appreciate the new ideas. I feel like after you've been married for more than a few years it's easy to keep expressing love in the same way you always have. The one that most stuck out to me was reading a book together and discussing it. I almost feel bad admitting it, but it's true. So often Katie and I have our family gathered around God's Word for family worship I forget Katie and I should read the Bible (or some other book) together. Some ways I date Katie? God has recently opened the door for me to speak on marriage at conferences. It allows us to get away from the kids (except for our youngest), and during that time dating Katie looks like giving her as much attention as possible while we're away.